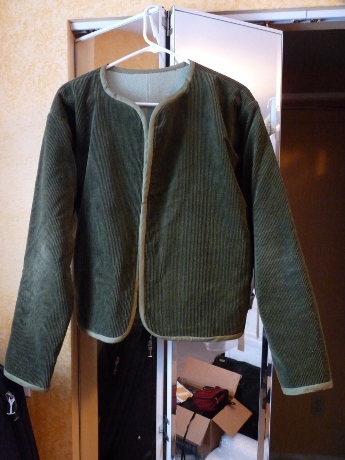 Green corduroy jacket with fleece lining. I had this green corduroy kicking around for years and years. I remember using it when my boys were little to make sleeping bags for their GI Joe’s! haha. It’s so very soft and I love the color, I thought it would make a nice little jacket. 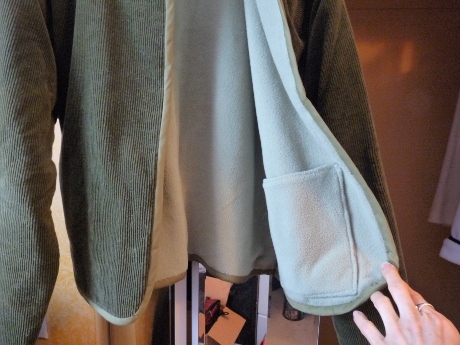 I found some light weight, pale green, baby polar fleece that I had from back when I did some professional sewing for a lady designing her own baby clothes line. I thought if I just line the whole inside I can bind the edges with bias tape, an easy, clean way to finish edges. I hand-stitched patch pockets inside. I wasn’t sure if I would add patch pockets, then decided that would look not as ‘clean’ or ‘chic’. But I do love a place to tuck some tissues or maybe drop your keys when your hands are full, so I hand-stitched some to the inside. 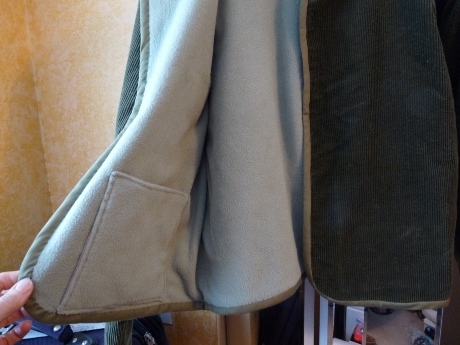 I made the pockets out of a sturdy thick flannel and the polar fleece. With fancy scarf my fiance sent me from England. I still haven’t decided how to finish the front, you know, buttons? Decorative stuff? I left it plain because I thought it’d be fun to play with. I’ve had NO TIME to play, but I found that the pretty scarf my sweetie sent me from England matches it to a T…I just trimmed off some of the frilly rufflely silk on one side (just a little too much frill for me) and it looks great! I’ve gotten many compliments on the look, but I still want to do ‘something’ with the front. 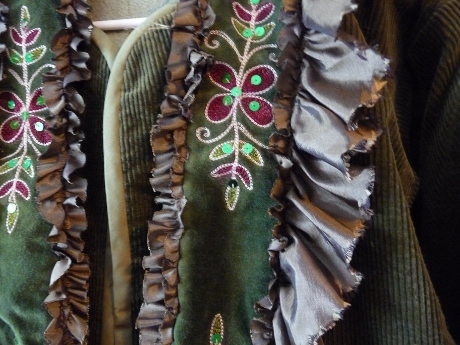 Here’s a close up of the scarf…isn’t it pretty? Pattern I used was supposed to be for quilters. The pattern I used was a basic no collar design for quilters to use patches of fabric. 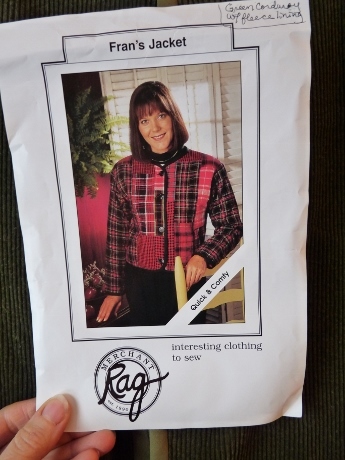 It’s by “Merchant Rag” and called Fran’s Jacket. I bought it a gazillion years ago when I worked at So Fro Fabrics. I’ll try to get a picture of me wearing it to show you….one of these days! 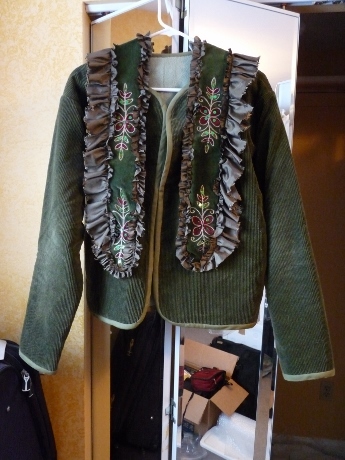 If you want to see more of my Jackets, keep an eye on “THIS PAGE”, I’ll be updating it as I go.